Cardinal Track Ready To Run! 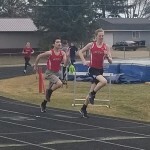 The Prescott Cardinals Boys and Girls Track and Field Teams are ready to make the jump in to their outdoor meet season, once this Spring Snow leaves the Tri-County Area, and Co-Head Coach Emily Calabrese joined KDWA Sports to talk about last week’s Intrasquad Meet, and getting ready for the move outside! © 2019 KDWA 1460 AM.